Located just outside Bloomfield in the heart of “The County,” Blue Wheelbarrow Farm is dedicated to producing fresh, organically grown vegetables of the highest quality and taste with a strong focus on promoting local agriculture and local food autonomy. The farm is a 17 acre property with one acre cultivated for vegetable growing. We specialize in salad mixes and baby greens, but grow a wide variety of other vegetables such as beans, beets, carrots, onions, tomatoes, etc. We sell our produce to several chefs and restaurants in the County, at local farmers’ markets, and at our farm stand on site. Cultivating community, celebrating the harvest, and feeding people fully is the foundation of the farm and business. 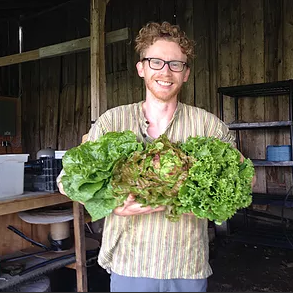 The farm is owned and operated by Aaron Armstrong, who has been working in the field (literally) of organic vegetable farming since 2010. Born and raised north of Toronto in Simcoe County, Aaron spent six years learning the best and most productive methods of organic farming around the world (working, interning, and WWOOFing throughout Ontario, British Columbia, Hawai’i, France, England, Scotland, Greece, Italy, and New Zealand) before bringing his favourite methods together to create his own farm in the spring of 2016.